Who is afraid of the urban poor? In Egypt, both the ruling elites and the urban middle class cling to the military regime, in the hope that they will be protected from a seemingly inevitable tide of social unrest. Mosa'ab Elshamy/AP/Press Association. All rights reserved.The face of the Egyptian revolt is that of thousands of protestors occupying Tahrir Square in central Cairo, chanting for the fall of Mubarak, the Supreme Council of the Armed Forced (SCAF), and the Muslim Brotherhood – all over the course of three years. The narrative revolved around young, middle class, technology-literate activists who used social media to galvanize the masses against the regime of the day. However, this narrative ignores another side of the Egyptian revolt; the role of the urban poor whose participation was key in the early successes of the revolt, especially in the clashes that followed with SCAF and the Muslim Brotherhood. The success of the first “Friday of Anger” came after the police force collapsed, which was not prompted by the protestors storming the Square, but by the attacks on police stations by the urban poor. Ninety-nine police stations were set alight that day as the urban poor exacted revenge against their tormentors. This narrative took a backseat for two main reasons. First, it contradicts the notion that the uprising was essentially peaceful; a narrative that middle class activists want to propagate as it garners sympathy both internationally and domestically. In reality, it was not as peaceful as many would like to think it was. The urban poor confronted the coercive arm of the state with violence, which was one of the main reasons the uprising against Mubarak was a success. The second reason is the middle class bias of the coverage of the revolution. The revolution was portrayed by both national and international media as a movement of the middle class, de-radicalizing its image and consequently removing the urban poor and their demands from the political scene. The events of 2011 and its aftermath were not the first where the urban poor took on the state. The urban poor have played a prominent role in opposition politics for decades, especially in the new quarters that emerged across Caro in the 1970s as the state started to reduce its welfare role. The most vivid examples were in the 1990s when Islamist militants, part of the al-Gama’a al-Islamiyya, gained popular support among the urban poor. The neighbourhood of Imbaba, for example, became a hotbed of militancy that required a massive police operation in 1992 to recapture it from the militants. The Gama’a was able to gain poplar support due its immersion into the local customs of the popular quarters. They regulated the morality of the neighbourhood, most importantly sexual morality, and gained prominence by acting as arbitrators in intercommunal conflicts – a role that the Emir of Imbaba, Sheikh Gaber, played well. This allowed him to gain the support and respect of residents. Why do the urban poor pose a threat to political order? This can be attributed to the spatial, political and economic nature of popular quarters that emerged from the 1970s onwards around Cairo. As the state started to retreat from the Nasserist social contract, taking a neo-liberal turn, it reneged on its commitment to provide affordable urban housing, which prompted new quarters to naturally emerge and come to life on agricultural or state-owned desert lands. They were illegal settlements inhabited either by rural migrants or by inhabitants of the city who could not afford to move within the old quarters. Thus, the mere illegal nature of these quarters placed the inhabitants in opposition to the state. These neighbourhoods had limited to no government services. This created an elaborate game of cat and mouse, as the urban poor attempted to negotiate, through a maze of government corruption and bureaucracy, their relationship with the state in order to obtain these basic services. The precarious nature of the urban poor becomes more apparent when one views their means of making a living. Most of the inhabitants of these quarters are engaged in the informal sector either as daily workers, peddlers or artisans working within their own quarters. This trend was accelerated as hiring in the public sector came to a halt coupled with the weakness of the private sector. With no other choice, millions were forced to work informally. Thus, one could argue that the lack of government services along with informal employment created a certain degree of independence for these inhabitants. I would even argue that they view the state as more of a foe, since it attempts to regulate and control the space they live in. This is made even more vivid when power relations within these quarters are examined. 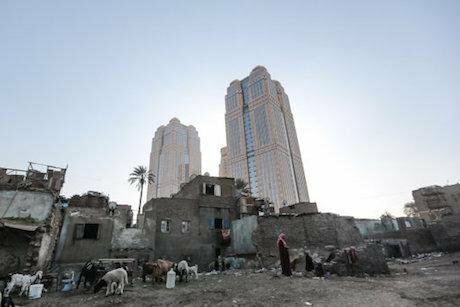 Like any other social group, the urban poor living in these quarters have an elite structure. The elites get their power from three main sources. First, in their ability to act as mediators with the state, helping members of their community obtain government services. This, of course goes both ways; the state relies on their intervention to maintain peace within the quarter and they act as gatekeepers, procuring government services in exchange for acting as mediators. Second, is the relative wealth of these elites compared to the rest of the urban poor. These elites constitute “lesser notables” as Salwa Ismail highlights; they are primarily involved in trade and are mainly wholesalers or retailers, occupying the position of the petty bourgeoisie below the bigger ruling elite nexus of military/crony capitalists. The final pillar of their authority is moral. Their adherence to the traditional values of the quarters allows them to act as mediators in inter-communal conflicts. Their duty is to reach a peaceful resolution to the conflict. As such, they have to be perceived as impartial judges between conflicting parties. This stems from traditional values of honor. The importance of this role stems from reliance on traditional methods of conflict resolution in an attempt to reduce the role of the state, since it is perceived as corrupt or unwilling to get involved. Thus, conflict is resolved through 'majaliss 'urfia' or traditional councils, where the quarrelling parties lay down their case and a negotiated settlement is reached. The job of policing the neighborhood and ensuring security is left to the inhabitants, not the police, who are reluctant to get involved anyway. In some cases, the police provide protection to petty criminals and drug dealers in exchange for becoming informants. Thus, the role of the police in these quarters is aimed at the subjection of the populace, with no focus on combating crime or resolving conflict. What does this mean in terms of relations with the state? This can be answered by looking at the relations between the elites of these quarters and the masses of the urban poor. Based on the role played by the elites, one would expect that they would be easily coopted by the state, however, in reality the picture is more complicated. In some cases, the elites were coopted by the state becoming members of the Mubarak era ruling party, the National Democratic Party (NDP), acting as a tool for government control. However, there are other cases where the elites ran for parliament as independents, winning seats then being asked to join the NDP. This shows a degree of independence from the ruling apparatus. In other cases, the local notable took up opposition politics in Islamist form, most notably during the 1990s when militant Islamism became rife in these quarters, such as Ain Shams and Imbaba. Thus, one can conclude that relations between the state and the elites is complicated and subject to tensions. On the other hand, there is the relation between the state and the populace, which is filled with antagonism and tension. The populace is perceived as a security threat to the state, especially if you happen to be young and male. This view has a number of manifestations. First, the popular quarters are spatially separated from other parts of the city by security checkpoints that are designed to restrict movement to and from these quarters. This involves the usual police harassment, humiliation through identity and security checks. Second, is the practice of 'ishtibah we taharri', which translates into inquiry and investigation, a practice that allows police officers to interrogate citizens simply because they look suspicious. This practice is used extensively against young males, which is sometimes also followed by planting drugs on the apprehended. Finally, this securitization has been enshrined in the law, issued in 1998 and known as the “thuggery” law, which punishes the use of “physical intimidation” with hefty prison sentences. This law has been mainly aimed at the urban poor. So, who is afraid of the urban poor? It appears that the obvious answer is the ruling elites, however, that would be too simple an answer. This fear is also prevalent among the urban middle class; they fear the social upheaval and violence the urban poor can set in motion. As such, they cling to the military regime in the hope that they will be protected from the tide of social unrest that now seems inevitable. In conclusion, everybody is afraid of the urban poor!